Six Bells--You can see how low the ceiling is. My recent trip to Europe began with flying into Gatwick airport, which is south of Victoria Station by a half-hour train ride. I stayed in Horley, Surrey (a suburb next to the airport) because I was only there for a day and a half. 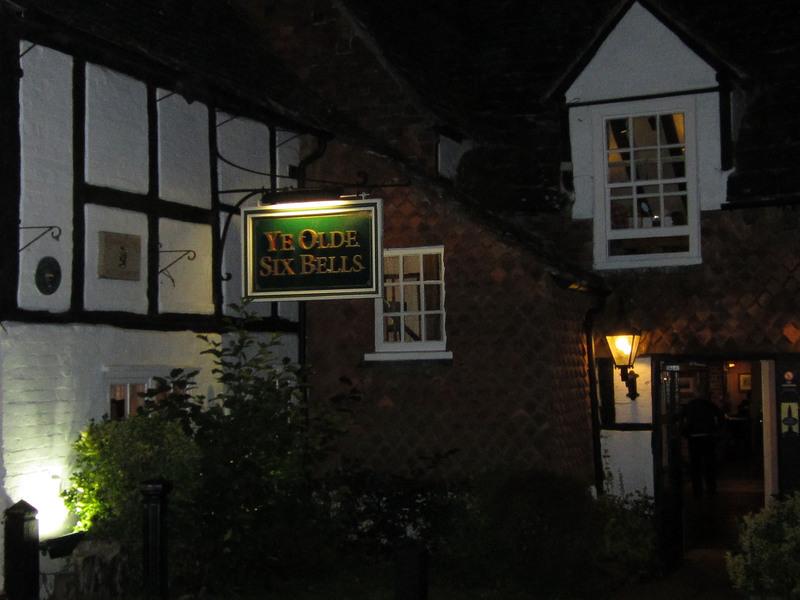 The first night, after a nap to reset my clock, I just wandered down the road to Ye Olde Six Bells. It was quite dark with inadequate lighting. I also brushed against overgrown nettles. Luckily it was just a light brush because my leg itched for about an hour. The history of this pub goes back around 700 years, when a man named Norman Lord want refreshment to get through the long sermons at St. Bartholomew’s. 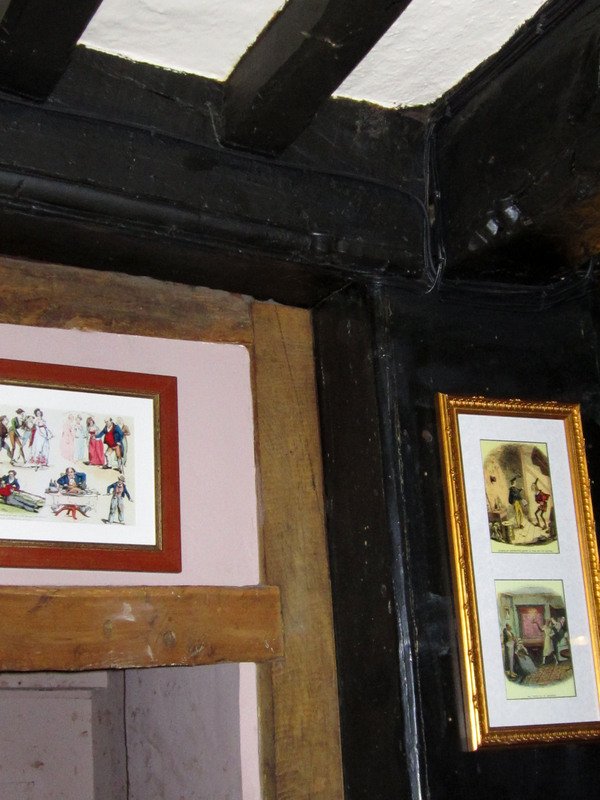 A place that old has whitewashed walls, huge dark wooden beams, low ceilings and rambling rooms. I imagine that over the centuries the rooms were added one at a time, the wooden floored ones being the oldest, though no floors would be original. The first floor might very well have been packed earth and straw spread over it. Buildings throughout the medieval era were white washed to preserve the mortaring and stonework and to add light to dark structures only lit by candles and oil lamps. Six Bells was all of this, with a note on the ceilings saying “Duck or Grouse.” Above the bar it said, “Before you ask, yes we have hit our heads a lot.” Since this seem to be the normal height for old pubs I must assume that people were shorter at one time, plus I imagine the places were time consuming and expensive to build, and space wasn’t wasted on high ceilings. It may have kept the warmth in as well. Unlike North American pubs, many British ale houses or public houses are part restaurant and you’ll see people bringing their children. The central and oldest area is the bar, and rooms jut off in three directions for diners to sit. The Six Bells menu is quite extensive and I had a fish pie, since it seemed traditional British fare; a mixture of peas (the English love their peas), potatoes, shrimp, smoked haddock and cod in a white wine, coriander cream sauce, with a salad of red onion, tomato, spinach and tongues of cucumber in a simple vinaigrette. It was tasty and filling, costing around 10 pounds. I was too full to try dessert, which some British just call puddings in a generic way. I like to sample new ciders and England is the place to do it. 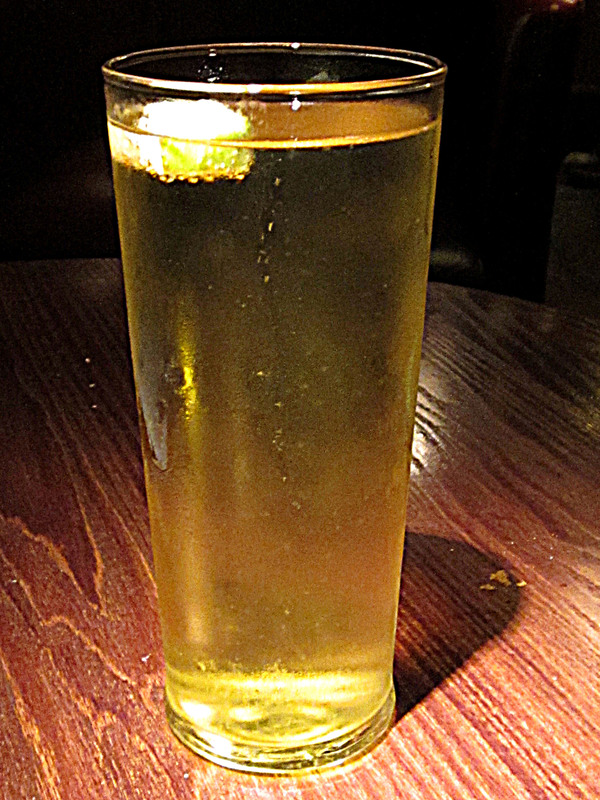 I tried the Aspall Suffolk cider at 5.5% alcohol (higher than most of the beers on tap). This drink worked very well with the smoky taste of the pie and I think the food brought out the cider’s flavor. Aspall is a light golden color, light on the tongue (medium effervescence), crisp apple taste and not overly dry. The flavor isn’t too strong but it’s more noticeable than Strongbow’s nondescript taste. Of all the ciders I tried on my trip this one remains one of my favorites. 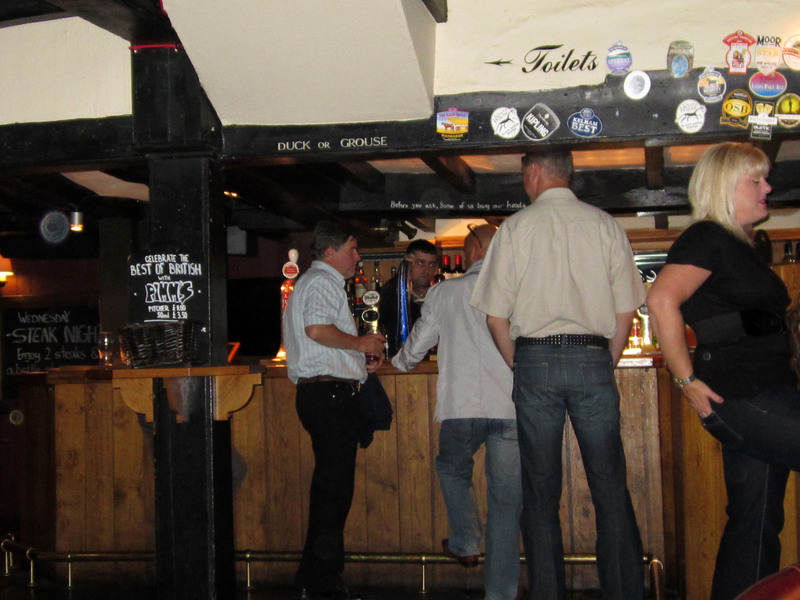 I would recommend Ye Olde Six Bells. The rest of Horley seemed rather small. The second night I had Chinese food and though it was a simple fare of broccoli, chicken and mushrooms I found the chicken tasted old. Not bad but not fresh, and I’m quite sensitive to the change in meat flavors. It could have contributed to the stomach unrest that hit me the next day as I arrived in Amsterdam.